Master Muffler Salt Lake City is pleased to over full tire service, including: sales, service & maintenance. Our expert technicians can repair flats, install new tires, and perform other tire maintenance like rotations & alignments. It may sound strange, but your tires need maintenance just like the rest of your vehicle. This has a lot to do with the weight distribution of your vehicle. The heavy engine pushes the tires under it into the pavement much harder than the tires that are not under the engine. 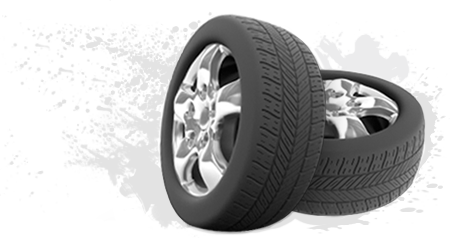 So, to prevent some of your tires from wearing down too quickly, thereby extending the life of all your tires, it is necessary to rotate them regularly. Alignments are often performed after tire rotations to correct for variations in tire wear. When your car is properly aligned, you will notice that your vehicle requires a lot less steering correction, increasing your safety behind the wheel. All regular maintenance like tire, oil, and tuneup service are great for your vehicle because each one is another chance for auto experts to get a look at your vehicle. The more often your vehicle is exposed to an experienced professional, the more likely they are to catch small maintenance issues before they develop into large auto problems. Bring your vehicle to Master Muffler Salt Lake City, where we are always looking out for you! Hours: M-F: 8 a.m. - 6:00 p.m. Sat: 8 a.m. - 4:00 p.m.